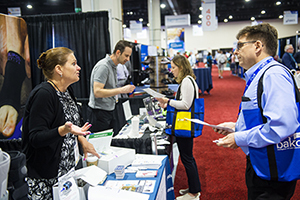 Exhibitor registration for the 2019 APMA Annual Scientific Meeting (The National) is now open. The meeting takes place in scenic Salt Lake City at the Salt Palace Convention Center, July 11–14 (exhibits are open July 11–13). The National is a top-tier, continuing medical education program that features a renowned faculty. It offers podiatric physicians and surgeons scientific and practice management content encompassing virtually all aspects of foot and ankle care. Your participation as an exhibitor allows you to join the myriad of companies that showcase the latest technology, products and services in the exhibit hall. You’ll interact face-to-face with an audience that has purchasing power, plus unparalleled authority and reach among patients. Complete details about exhibiting (and sponsorship) are available in the meeting prospectus. Online exhibitor registration is now available. View the interactive exhibit hall floor plan and purchase a booth today. Online purchases require payment by credit card. To pay by check, download the meeting prospectus, complete the booth space application (p. 14), and return it to APMA with your payment. All exhibitors must supply a certificate of liability insurance (COI) no later than Friday, June 7, 2019. There are no exceptions. Exhibit hall access will not be granted to any company that does not provide a COI that meets the show requirements. You must carry general liability coverage from an insurance company in good standing with minimum policy limits of $1,000,000 per occurrence and $2,000,000 aggregate. This insurance must be in force during the lease dates of the event, July 9–13, 2019. Your certificate must list APMA, 9312 Old Georgetown Rd., Bethesda, MD as the certificate holder. APMA has requested that Rainprotection serve as its insurance management company. In addition to being able to provide exhibitors with insurance, Rainprotection is also collecting and verifying that all insurance certificates, regardless of the insurer, are verified for compliance. If you have your own insurance, please submit a copy to sales@rainprotection.net. If you need coverage, you may purchase it from Rainprotection for $94. Complete details are available here. Booth supplies (furnishings, internet, electricity, A/V, etc.) are not included in the booth fee. Exhibitor services are provided by GES, and can be ordered at the Expresso by GES site. Orders placed by June 14 will receive a discount. Savings are available on other packages and supplies. Visit the Expresso by GES site, available in April, for complete information. Prices listed include delivery, rental, and removal; exclude taxes. Warehouse receiving hours are Monday-Friday, 8 a.m.-4:30 p.m.; closed 12 p.m. to 1 p.m., and holidays. Please Note: Shipments arriving before Monday, June 10, 2019 will incur a storage fee, and shipments arriving after Wednesday, July 3, 2019 will incur a Late to Warehouse Fee. Tuesday, July 9, 2019, 11 a.m.-4 p.m.
Wednesday, July 10, 2019, 8 a.m.-5 p.m.
As indicated in the Rules and Regulations published on the reverse side of the booth space application, all exhibitors are expected to adhere to the exhibit hall schedule. There will be no booth set up the morning of the show unless prior permission is granted by APMA. Carpeting (or other covering) of booth space is required. Carpet may be rented from the exhibitor services provider, GES. If booth carpet is not ordered and installed prior to show opening, APMA will have GES install a standard color at exhibitor’s expense. A penalty of $500 will be assessed against exhibitors that dismantle or begin to dismantle before the exhibit hall closes. Exhibitors may enter the exhibit hall one hour prior to opening, and may remain one hour after the exhibit hall closes. Optimize your exposure during and after the meeting. Become a meeting sponsor. Download the meeting prospectus for details. Advertise in the meeting newspaper, The National Today, the meeting app, or other meeting-specific materials. Advertising opportunities are also available in additional print and digital media. Send a digital promotion to meeting attendees. Contact the exhibit hall manager for details. Order your complimentary set of pre- or post-meeting registrant data to contact attendees before or after the meeting. Are Other Exposure Opportunities Available? APMA's membership consists of the majority of podiatrists in the US (over 80 percent). APMA provides you with numerous opportunities that will surely complement your marketing activity and provide increased exposure to your current and potential customers. Read more about corporate opportunities. Your competitors are already enjoying the benefits of sponsorship and exhibitions, and APMA welcomes you to do the same. Questions? Contact the exhibit hall manager via email or at 301-581-9200.